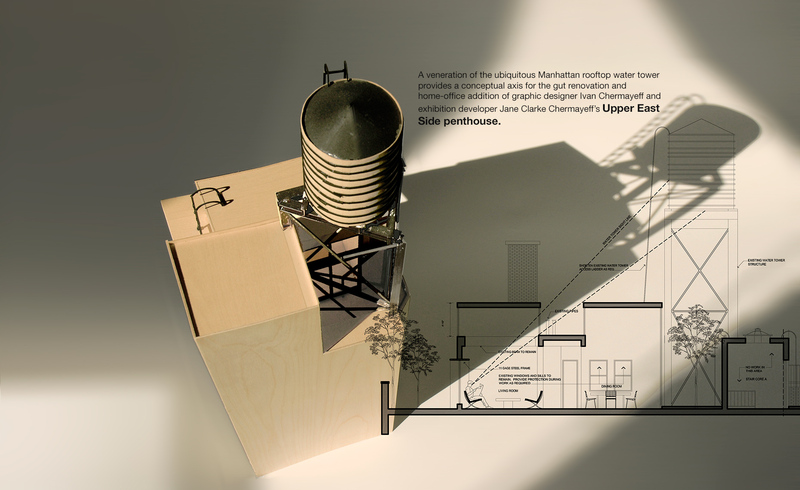 The veneration of the mundane and ubiquitous Manhattan rooftop water tower provides a conceptual axis for the gut renovation and home-office addition of graphic designer Ivan Chermayeff and exhibition developer Jane Clarke Chermayeff’s Upper East Side penthouse. The rooftop's most dramatic architectural element, a water tower looming thirty feet above the roof, is incorporated into the project’s visual and structural vernacular, transforming an icon of the Manhattan skyline into a residential expression. By breaking through the ceiling and incorporating undeveloped roof space, a windowed second story added above the dining room opens skyward and creates dramatic vistas that frame the formerly invisible water tower, recontextualizing it as outdoor sculpture. The water tower's industrial steel bands, wood and trusses resonate in the future home-office addition at the southern end of the apartment. The office space—linked to the apartment via a narrow 200-square-foot greenhouse—appears to be a water tank tipped sideways on the roof. Clad in weathered copper, the interlocking ovoid steel cylinders are pierced by windows that reprise the urban skyline.